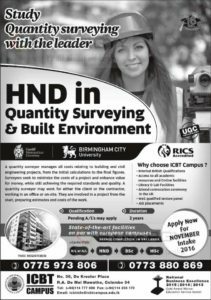 ICBT Campus invites applications for the HND in Quantity Surveying \ & Built Environment for the new enrollment in November 2016. A quantity surveyor manages all costs relating to building and civil engineering projects, from the initial calculations to the final figures. Surveyors seek to minimize the costs of a project and enhance value for money, while still achieving the required standards and quality. A quantity surveyor may work for either the client or the contractor, working in an office or on-site. They are involved in a project from the start, preparing estimates and costs of the work. Why choose ICBT Campus ? Those who are with G.C.E (O/L) also could apply for this programme.